Gardaí are appealing for witnesses in their investigation into “all circumstances” around what could have caused the fire. 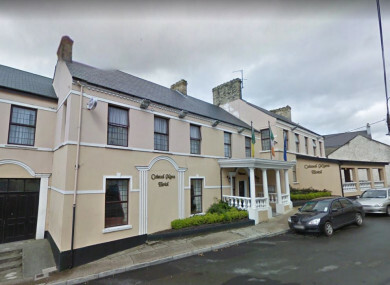 A FIRE BROKE out in a Donegal hotel where 100 asylum seekers were meant to live in when they begin to arrive next week. Minister for Justice and Equality Charlie Flanagan condemned what he said was an arson attack on the Caiseal Mara Hotel in Moville. Gardaí are investigating the large fire that broke out at the Caiseal Mara Hotel on Foyle Street at around 4.30am this morning. A man in his 50s was taken to Letterkenny Hospital for treatment, Gardaí said, and there has been extensive damage to the premises. Anyone with information or who were in the area that may have seen suspicious activity on Foyle Street, Moville, Co Donegal this morning prior or after the fire is urged to get in contact with Buncrana Garda Station on (074) 9320540, the Garda Confidential Line, or any Garda station. The Caiseal Mara Hotel was due to become a Direct Provision centre over the next few weeks, with the first group of 20 or 30 people to arrive next week. A local activist group Inishowen Together issued a statement at the time of the announcement, saying that the asylum seekers would “have many new friends here”. We understand that people seeking asylum have faced untold difficulty in the countries that they have fled – the horrors of war and the terror of political and religious persecution – and we would like to offer solidarity and whatever support we can provide. We're saddened & slightly alarmed this morning to hear that the Caiseal Mara Hotel in Moville, the property earmarked as a Direct Provision Centre has burned down. Today, the group tweeted out that it was “saddened and slightly alarmed” to hear that a fire had broken out in the hotel. Local activist Siobhan Shiels is a member of Inishowen Together,which set up Inishowen Welcomes, aiming to promote the inclusion of Syrian families who arrived in Cardonagh last year. Shiels told TheJournal.ie this morning “shocked” by the news. She said that this morning, she got a call from someone who’s involved in bringing the asylum seekers here who asked her if it was true. “There’s a family living in there at the moment. It’s horrendous,” she said. Although a family is living in the hotel, it’s understood they weren’t in the building when the fire broke out. She said that despite the fire, she doesn’t “want to get derailed” from welcoming the asylum seekers. The centre is still going ahead as planned, and there’s a group ready to welcome them. We want the transition to be as human as possible. She said that the first group of 20 or 30 asylum seekers are due to arrive in a week. When asked where they’ll go if the smoke damage is too bad for them to live in the building, Shiels says “we just have to wait and see what happens next”. The Minister of State for Equality and Integration, David Stanton also condemned the attack. “The hotel is being prepared for accommodation by persons seeking international protection in Ireland. That people would target such a building in this way is deeply shameful. The Ministers thanked the emergency services for their quick response. If you have information, you can get in touch with Buncrana Garda Station on (074) 9320540, or contact the Garda Confidential Line or any Garda Station. Email “Justice Minister condemns arson attack at Donegal hotel being prepared for asylum seekers”. Feedback on “Justice Minister condemns arson attack at Donegal hotel being prepared for asylum seekers”.